Thomas Dunne Books, 9781250101167, 224pp. 2016 will mark the 75th anniversary of the attack on Pearl Harbor that pushed the United States into World War II and sent thousands of US Marines to fight and die on tiny islands half a world away. Today, Iwo Jima, Okinawa, and Tarawa are household names that hold legendary status on the Marines’ roll of honor. But in 1941, the Marine Corps was a small expeditionary force with outdated equipment and an unproven new mission—amphibious assault. 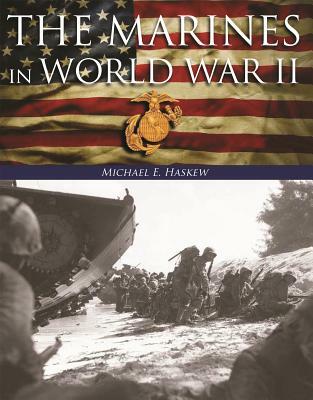 Michael E. Haskew's The Marines in World War II charts the rapid development of this famous fighting force from two brigades, totaling fewer than 20,000 servicemen, to two full corps with six divisions, five air wings, 21 battalions and as many as 475,000 Marines. In addition to chronicling the hard fought battles at places like Midway, Guadalcanal and Guam, the book also addresses the important role played by Navajo code talkers during combat, as well as the changes that took place within the Marines during the war, such as the admission of its first black members and the gradual desegregation of the Corps. Michael E. Haskew is the editor of WWII History Magazine and the former editor of World War II Magazine . He is the author of a number of books, including The Sniper at War and Order of Battle. Haskew is also the editor of The World War II Desk Reference with the Eisenhower Center for American Studies. He lives in Hixson, Tennessee.